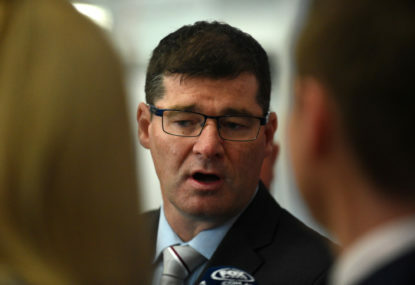 Sydney Roosters CEO Joe Kelly has been suspended from the game for a minimum of nine months and the Manly Sea Eagles hit with a $750,000 penalty as the NRL today announced their sanctions following the Sea Eagles’ salary cap breaches. Kelly has been suspended for 12 months but will be allowed to return to work on New Year’s Day 2019 if he completes ‘appropriate governance training’ before then. Manly’s COO Neil Bare has also been suspended for 12 months but he too will be allowed to return early if satisfactory training is completed. The Sea Eagles have been hit with a $750,000 fine but a third of this will be suspended so long as the club undertakes governance training, bringing the minimum amount that must be paid down to half a million. They will also have a $660,000 penalty applied to their salary cap over the next two seasons. NRL CEO Todd Greenberg said the league’s investigation had confirmed salary cap breaches taking the former of undeclared third-party agreements. “The investigation found a number of cases where players were offered undisclosed benefits outside the salary cap to attract them to the club,” Mr Greenberg said. “These benefits were in the form of third party agreements which were never declared to the salary cap auditor. “In other words, Manly had a financial advantage in securing the services of players who may otherwise have gone to other clubs. “Our salary cap is the main reason we have the closest competition in Australian sport and we will not tolerate any attempt to breach it. The Sea Eagles however won’t be hit with any kind of competition point penalties, meaning the side – currently 1-2 and ninth on the ladder – haven’t hurt their chances of playing finals this year. “We have to ensure the penalties for cheating the cap remain a deterrent,” said Greenberg. “We have had such a successful start to the 2018 season that every fan from every club can reasonably expect their team to play in the finals.